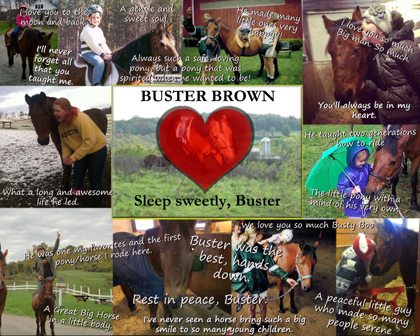 Buster Brown died February 27, 2014 at the ripe old age of 32. He was one of our oldest, dearest horses: a fierce and loving soul in a small pony’s body. He had taught innumerable campers how to ride in the arena, on trail rides, and jumping fences over his twenty-five year stay at the farm and no other pony can compare to his personality, compassion, or wisdom. The Buster Brown Scholarship Fund will assist kids to attend camp who do not have funds. Buster touched so many and brought countless smiles; we hope that his spirit may live on in the smiles of those campers we can help. Please donate any sum. And Buster, may you rest in peace.